I’ve done a list like this previously for painting, so today I thought I’d cover the miniature hobby supplies that everyone needs. What this is going to cover is the stuff you need for miniature modeling, sculpting, conversions, etc. It’s aimed at being a helpful list for new hobbyists, but veteran hobbyists may find an item or two they hadn’t thought about as well. Now, this is geared specifically at miniature wargamers, those who need to put together lots of model kits, but it can be useful to any miniature hobbyist as well, like model trains, model cars, dollhouse hobbyists, etc. Also, like I did the last time, I asked on Twitter what the must-have tools were for fellow hobbyists. I got quite a few responses and I’ve included those below. The items are in alphabetical order. Here we go! This is the stuff that everyone should have. Think of this as the basics, the minimal you need to get by in the hobby. Basically, if you just got into the miniature hobby then here’s a great checklist of stuff to get. Further below you’ll find a list of items that aren’t required but are nice to have. Having some Blu Tack on hand is great for a number of things. Many of us also use it for testing posing with models. That’s what I use it for the most. It’s great to see how things will look before you commit to gluing something together. You can find so many uses for this stuff and it’s super cheap to buy as well. Yanarfal also mentions a business card, but I cover that down below. Not sure if its for here or painting – but for me it’s silly putty 😄 I cover the areas I don’t want painted in it so I can airbrush other parts of the model. Saves a lot of time over tape! And she has a point. If you can’t get yourself some Blu Tack, or maybe you just like silly putty, then give it a shot. Clamps comes in all sorts of shapes and sizes. There’s two sizes I focus on, big and small. For big clamps I use the woodworking slide clamps. I don’t use this often, but now and then you have a difficult tank you’re dealing with, or maybe it’s a Knight Titan, in which case this larger slide clamps are extremely useful. For small I have some plastic spring-loaded clamps. These are the ones that get the most use as they are perfectly sized for miniatures. These get used for your typical stuff like holding parts in place or trying to reduce a glue seem. Wherever you choose to get them, and in what sizes, st up to you but be sure to get some. I debated this one, as it’s not required, but it’s inexpensive and can be really handy to have. A cutting mat is great for a few reasons. One, if you don’t have a dedicated hobby space, then having a cutting mat down will protect whatever surface it is that you’re working on. Two, a cutting mat can prevent you from dulling and damaging your hobby knife. Having your knife slide through a model and into a wood table can dull it pretty quickly. However, a cutting mat is a more receptive surface and won’t dull or damage your blade. For years I put off getting a set of files. Knives. Many blades. Steel ruler. Pin vice. Files. Wet & dry sandpaper. Day light lamp. Sculpting tool. More knives. Fine saw. Cocktail sticks. Spare knife. Pins. The thing is, hobby files are really useful. The thing I love them for the most is metal models. Cleaning mold lines off metal models is a chore with a hobby knife, but takes seconds with a file. Files work great on plastic and resin too, especially if you’re doing some heavy work. You can pick up a set of files with a variety of sizes and shapes for little money. There two common types of glue you’ll want, PVA and super glue. PVA glue is your typical white glue we use for all sorts of purposes. Elmer’s Glue is a PVA glue. What PVA glue is great for is when you’re doing basing on your miniatures. You can slather the PVA glue on the base and dip the model into the basing material. Also, if you happen to be a fan of making terrain then you’ll use a lot of PVA for that. As for brands, I’m a big fan of Mod Podge. You can get a HUGE container of this stuff for an extremely low price. I use Mod Podge for my basing needs on everything and a container of this will last me years. Other than online, you can pick up Mod Podge at most craft stores in the US. I’m not sure if it’s carried in European stores though. Of all the brands I’ve tried, Mod Podge is the one I always go back to. The need for super glue is obvious, you gotta put together those models! There is no shortage of super glues out there, but I’ve always been a fan of the Zap super glue. It’s not the cheapest one out there, but it comes in a few different formulas like: penetrating, gap filling, slow cure, etc. I love using the gap filling version they have because it does just that – fills gaps. Put a little extra on the parts, squeeze together, and let the glue fill in the rest. Now, I know a lot of people like the Gorilla Super Glue. I haven’t used it, but it’s popular and comes highly recommended from other hobbyists. I’ve also seen people use the Loctite Super Glue, and every brand in-between. Super Glue. Seriously even if you are using plastic glue, super glue for temporary tacking things together and also gluing small flesh wounds due to the slip of a blade. Even if you don’t plan on doing any freeform sculpting, having green stuff on hand, or some other sculpting medium, is pretty well required. You’re going to have models that need a little TLC, ones with gaps you need to fill, etc. Basic gap filling with green stuff is a skill we all learn at some point. I personally like using green stuff, but you can find other types of epoxies to use. There’s blue stuff, brown stuff, etc. The difference is typically the strength of the epoxy, the working life of it, how well it bonds, etc. Now, for gap filling, I’m a big fan of Citadel’s Liquid Green Stuff. It’s just what it sounds like and makes gap filling super easy. I did a tutorial on that if you’re curious about it. We need to cut things so we need a hobby knife! Not a ton to say here about this obvious tool. There’s all sorts of brands available, like X-acto, and you can’t go wrong with them. X-actor even offers some different blades you can insert for specific tasks, though those blades will also fit into another brand that uses the standard sized blade. This is another inexpensive tool that you absolutely need. I covered this in detail in my painting tools article, but it’s worth covering again here. You need light to work by when you’re working with models, plain and simple. For hobbying you can get by with a smaller, cheaper light. There’s no reason you can’t get yourself a standard desk light and call it a day. That’s what I did for years and years. If you go this route, I would suggest getting yourself LED daylight bulbs. It really makes a world of difference. However, you can also spend a little money and upgrade your lighting to something bigger and brighter. I use a Normande Daylight Clamp Lamp. It’s a great hobby light that I highly recommend. The light is bright, covers a large area, and it even has a magnifier should I need it. Other people have had a lot of luck with Ottlite lamps. Ottlite has a big variety of lamps that range from small desk lights to larger hobby lights. It all comes down to how much you want to spend. I haven’t used an Ottlite, but I know a ton of hobbyists who do and they swear by them. A note pad and a pen. I keep track of the colors I use on models and can make a shopping list of hobby supplies. I can’t be the only one who forgets stuff 5 minutes later, right? Anyone who has glued things together knows that sometimes you need something a bit precise for getting excess glue off, and business cards makes perfect sense. Like I said, I use paper towel for super glue cleanup, but Yanarfal has a great idea there with the cards. Also, paper towels are great to have on hand for any sort of mess you need to clean up. It’s an obvious thing to have but worth mentioning. Pliers are just universally useful for all sorts of stuff. Small pliers. They’ve saved me from disaster more than once when de-sprueing a miniature. I absolutely agree with Office Painter here. I’ve also used mine to remove stuck blades in my hobby knife, bend metal models, remove paint-stuck caps from paint bottles, and so much more. You also don’t have to spend a lot, but like any tool, the more you spend the more value you’ll get out of it. So, I wouldn’t recommend getting the absolute cheapest pair here. Sandpaper is great if you do any sculpting, but even if you don’t sculpt you can find it useful, like cleaning up from sprue clipping, or smoothing out some rough spots on models. I use 400 grit sand paper for anything modeling related. Anything grittier than that will leave marks. As covered above with green stuff, you’ll need some sculpting tools to use with it. When I first got into the hobby, I picked up some metal sculpting tools for really cheap. I still use those tools today actually. They’re perfect for all sorts of things. If you want to upgrade a bit, or you want to get more into sculpting, then I highly recommend silicon sculpting tools. These things are great for all sorts of sculpting tasks, but I love them the most for smoothing out green stuff. They aren’t cheap, but if you pick up a few of these then you’ll find they last forever. For years and years I didn’t buy these. I instead used my hobby knife to cut things from the sprues. The problem there was the occasional slip that would result in slicing something I shouldn’t. I eventually got myself a pair of sprue snips and kicked myself for not doing it sooner. Now, you can buy Citadel branded snips at a premium, or you can get yourself some affordably priced ones at a craft store or online. The ones you’ll find in a craft store are labeled for jewelry and often referred to as a flush cutter. Name aside, it does the same job as the Citadel version but for a whole lot less. Toothpicks/Cocktail sticks. Useful for stirring things, precisely applying glue and as random terrain bits! Cheap, disposable and endlessly useful! I completely overlooked toothpicks, though I do use them. I also use paper clips. you will always need something to use as a pin, as a puncture for a clogged superglue, as a small sculpting tool, for converting material… these two are always on my desk. you always need them. They are perfect for clearing clogged paint bottles, like those from Vallejo, which is what I use them for 99% of the time. Also, paperclips are perfect for pinning miniatures. A sharpened cocktail stick! Perfect for getting rid of pesky hairs on models, flicking off grains of dried paint, soaking up excess superglue, the uses are eeeeeendless!! I don’t often need tweezers, but they are so useful for those times I do. You don’t need anything fancy here for tweezers. Your standard run-of-the-mill variety is more than fine. You can, however, get some that have a 90 degree bend, are longer, etc. Basically, hobbyist tweezers. They will make your life a bit easier if you want to upgrade a bit. These items are things that will make your life easier, and sometimes the items can be a bit expensive. You don’t need this stuff, especially when you’re starting out, but many of us end up with it after years in the miniature hobby. They are precise blocks of steel measuring 1 inch by 2 inches by 3 inches. All the faces flat & the edges are 90′ and they have a lot of weight to them. Now, these 1-2-3 blocks looks super useful and I’m definitely checking into getting some myself. I haven’t done this, but it’s a great idea. It’s a cheaper replacement for astrogranite debris, mixes with acrylics for any colour you want, and is perfect for simple basing. Now, of course having a chair is a must-have, however, I’m referring to a good hobby chair. A good chair is often overlooked. Hell, I forgot about it in putting together this list, so I’m glad BadBabyBunny reminded me. I use a computer chair, and I know a fair amount of people who also do. I find it’s a very affordable way to get a chair that’s ergonomic, easy to move around, and comfortable for a reasonable price. You can use anything though, as long as it’s comfortable. The more comfortable the chair, the longer you can work on projects. You want something you can spend hours in and enjoy the hobby. Nobody wants a chair that they have to get up from every 10 minutes because it’s uncomfortable. When you’re new to the hobby, you’ll probably use whatever chair you can, I know I did. However, do invest a bit when you can and get yourself a nice chair. A Dremel is a tool of many uses. You can use it to cut models (especially metal ones), sand, drill, and more. I would not recommend using a Dremel if you’re new to the miniature hobby though. There’s some skill involved in its use, plus you need to understand the basics first. However, once you’ve got the hang of things, a Dremel can be an invaluable asset to have. Most of us own one for that reason. If you build any sort of terrain then you’re going to want one of these. You can cut foam with a knife, but a foam cutter makes the job so much easier. This is a really inexpensive tool to have, and the way it works is it heats up a wire and you use the wire to cut the foam. A foam cutter works by battery, though you can get some that plug into an outlet. I didn’t realize how awesome this really simple tool was until I got my own foam cutter. It lets you get pretty creative when you’re cutting foam for making terrain and scenery, which in turn lets you create even better looking terrain. I have not used a hobby saw, but those who do use them will swear by them. I tear through paper clips. Pretty much essential. Paper clips, hobby drill, hobby saw, and sandpaper are probably my most used items. This can be great for larger projects, including making terrain, but also dealing with big models. Do you need to slice a model in half? Use a hobby saw. It’s far easier than trying to carve something in half with a hobby knife. Some people will simply use a Dremel, but if you want precision then you can’t go wrong with a hobby saw. This is another item more aimed at terrain makers, but it can be used for other things as well. I actually use it for creating icicles for the bases of my miniatures. There’s others who use it to create water surfaces (ponds, pools, etc), and others still who use it for grostique Nurgley/undead type of stuff. A hot glue gun isn’t required for your typical everyday type of hobbying, but having one is great for when you need it. And, for how cheap they are, there’s no reason to not get yourself one. A pin vise is a small hand drill that we hobbyist use for pinning models (creating a more secure attachment), and even things like drilling out gun barrels on models to give a realistic look. You don’t need a pin vise, but damn it – they’re super handy to have. Pin vises are a must-have as well if you plan to do any magnetizing of your models as well. You need to create the holes for the magnets to sit in, and I like a pin vise because of the control. My recommendation on a pin vise is to get one that has more than one collet. The collet is the part that the drill bit is placed in and secures the drill bit in place. You want multiple sizes to accommodate different sized drill bits. You can find quite a few pin vises that have multiple collets and they store inside the handle of the pin vise, which is super useful and convenient. The pin vise I use does this as well. Plasticard is known by many names. Regardless of name, plasticard is a thin plastic sheet that you can cut for a variety of uses. I would say it’s mostly commonly used by scratch builders, and also by converters. Plasticard is perfect for creating nearly anything. You can create swords with it, metal platting on a tank, rivets (using a hole punch), and so much more. It comes in a variety of thicknesses and even textures. It’s not something you’ll pick up when you start out in the hobby, but if you find yourself enjoying the process of making your own stuff, then you’ll absolutely want to get some plasticard. I know it seems silly to put a steel ruler in the nice to have items, but you can really get by without one. However, if you get into any sort of scratch building or terrain crafting then a good steel ruler is invaluable. Not only will a ruler (of course) help with measurements, a steel one is the perfect guide for a blade. I use mine a lot when I’m cutting plasticard. So, snag a steel ruler when you can. There’s a lot of these out there, but basically they let you roll over something, like green stuff, to create a texture. In fact, Eternal Wargamer did a great tutorial here on using some to create cobblestone bases. I love my Green Stuff World textured rollers too. Theyre great for knocking out bases quickly. Plus if you make terrain, theyll leave impressions on pink foam and foamcore for walls or walkways. The pink foam application I had not though of and it’s brilliant. Everyone I know who has one of these rollers absolutely loves them. 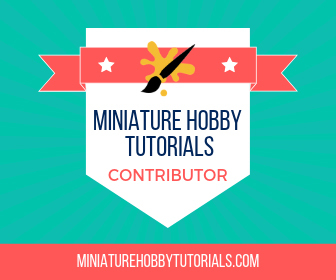 Well, there you have my list of miniature hobby supplies that everyone needs, plus the nice ones to snag when you can. I’m completely sure I’ve overlooked something, which is easy to do when you use something all the time. So, if you’ve got a suggestion then please let me know in the comments. On a related note, on my other blog I have an article covering hobby tool organizers, boxes, storage, etc., that you might find interesting. I mean, we all have to put these tools somewhere, right? I’ll second the hobby saw. I have two of them and they are endlessly useful. Especially when cutting the resin gates off of large Forgeworld models. When I was checking into hobby saws, I saw some awesome electric ones that were like table saws but for hobbyists. I could totally see buying one of those. I would probably end up lopping off a finger! My blade discipline is terrible. Hah! I hear that. So many wounds with just a blade, never mind a saw. I think my list of true “Must-have” tools would be much shorter. A decent knife and some glue (I’d put plastic cement in there alongside PVA and Superglue) is really the absolute minimum. Next tier would be a decent cutting surface (could be designed for mini work or something like a kitchen cutting board), sandpaper and/or files, and sprue clippers. Then we get into the rest of it. – I was initially dubious, but I found I do prefer brass rod to paperclips. Easier to find in specific diameters to match drill bits, better long-term resistance to mechanical stress, and it feels like it takes superglue better than paperclips do. – I like Mod Podge for “full strength” work, but I find that Elmer’s thins better with water, so I keep both on hand. – For most purposes, I prefer a pin vice to a Dremel. Unless you’re working with a lot of metal Models, the better control with the pin vice is usually an excellent tradeoff for the lack of raw power. – My most common use of Blu-tac is actually securing Models to sticks for priming. So much easier when you can tilt the Model around instead of the spray can to hit all the angles. Also useful in some situations for making options swappable more easily than using magnets. Not everywhere, but for stuff like StormTalon weapons and Dreadnought arms, where the join has plenty of surface area and is completely hidden, it’s fantastic. – Some great suggestions here that I hadn’t thought of, or just hadn’t got around to picking up. I’m doing enough terrain work these days that I do need to get a foam cutter, and the 1-2-3 blocks and ceramic stucco sound really useful, too. I need to pick up a new blade for my hobby saw, too, the old one got all rusty eventually because it went so long between uses, but when you need it, nothing else will do. True. You can do a lot with a few basics, so some items aren’t truly must-have. I know I started with less than I listed but I also had no clue either. I do mean to get some brass rods. I haven’t done any pinning for a while so I haven’t thought about it. A lot of times, when I’m doing basic assembly/kitbashing/relatively minor conversions, I do that while watching TV or something, and all I generally bring over from my modeling table is clippers, a modeling knife, and glue. Everything else, I only need for more complex or involved projects. Wow that is an extensive list! Well researched and put together. Would agree with all you have on there. Very useful for those starting out and needing to know what to get. Thanks! It’s the type of list I wish I saw when I got into the hobby, that’s why I went big with it. I did mention Liquid Green stuff in the Green Stuff section. Clay shaper tools I also mentioned but I called them silicon sculpting tools, assuming we’re talking about the same thing anyway. What? You missed something in a 3,200 word article? Blasphemy! I find I can more easily justify spending money on tools than models. I guess because with tools you’ll got lots of use out of them regardless of the game, army, or particular model. More bang for your buck basically. A bit late to the game, but bananas and regular hydration (water, mostly). I get shocking cramps in my thumbs after holding miniatures and painting. Maybe I’m doing it wrong. When my hands cramp, apart from taking a break, eating a banana or having a bottle of water on hand also massively relieves the cramps and stops them returning. You’ve mentioned the banana before. Unfortunately, it’s not something we have on-hand in my house. That being said, since taking more conscious measures to make sure I drink enough water throughout the day, it hasn’t been an issue for a few months now.